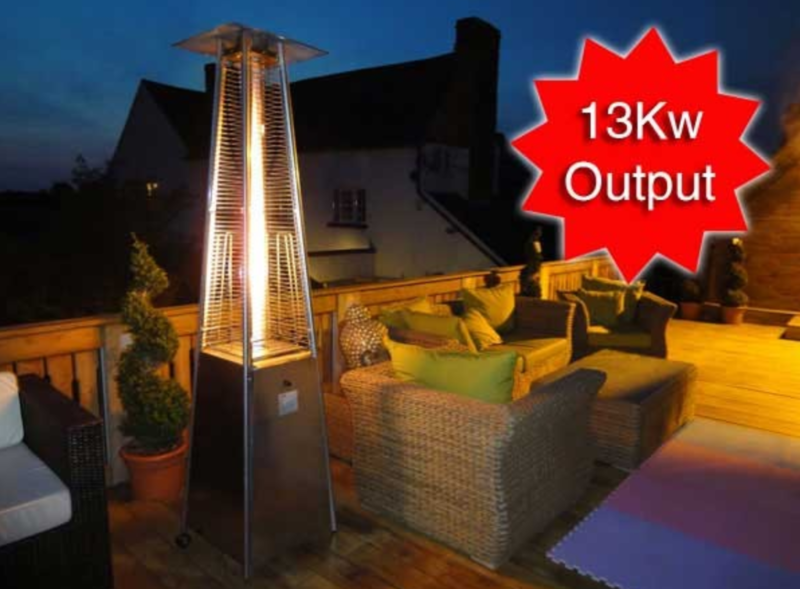 The Athena Plus is in a league of its own with an impressive 13kw heat output, not only is the visual effect of the real flame shooting upwards within a glass tube totally mesmerising but the Plus version has the highest heat output compared to all other versions of this amazing Patio Heater. Standing over 2m tall the pyramid design gives the heater stability and includes a safety cut off in case the heater is tipped over a certain angle. The Athena Patio Heater has a great presence, made from aluminum and stainless steel giving it a stunning look, it is also totally rust proof and can be used all year round! What Gas does the Athena Patio Heater use? The Heater can be run on either Propane or LPG Gas and can house a standard Patio Gas bottle, available at all local Gas outlets. Once in situ the Athena Patio Heater looks amazing even when not in use the heater looks very stylish unlike alot of outdoor heaters. The functions are very easy to use with a battery operated ignition and easy lift on/off side panel giving access to the controls and gas bottle compartment. Another great feature is the ability to move the heater with ease, simply tilt back and wheel to any location on your patio using the inbuilt wheels on the base. Keeping the heater clean is also easy is it comes with a handy cover that slips over and zips in place (let it cool down first after use! ).